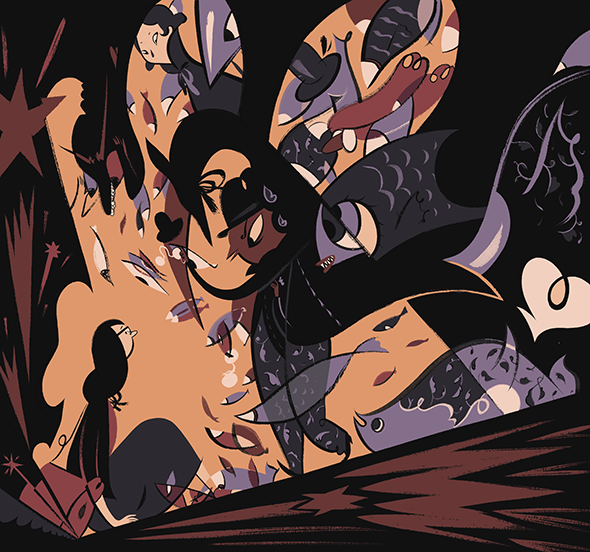 Roman Muradov’s comic In a Sense Lost and Found, reviewed. Roman Muradov’s first book is a wonder of inventive illustration. A panel from (In a Sense) Lost & Found. Some comics win you over with a propulsive plot that makes a book’s drawing style irrelevant, or at least not that important. It’s easy to overlook artwork that isn’t quite to your taste if the story a comic tells pushes you forward, flipping pages eagerly to find out what happens next. But then there are comics that are so perfectly beautiful that the first time through them you neither perceive nor care about the plot at all. Instead, reading them, you find yourself dreamily turning the pages, soaking in panel after panel of gorgeous images. You go back later and re-read the book for its other elements, of course, but your first encounter is the most powerful one, and it’s entirely visual. Roman Muradov’s first book, (In a Sense) Lost & Found, is that kind of comic. Though I later enjoyed its fanciful story of a young woman searching for her stolen innocence, what drew it to me first were its moody dark grays and purples, its Jazz Age figures and expressionistic street scenes. The book offers a real visual rhythm to the attentive reader: Again and again, its small, detail-filled panels pile up page by page, building tension—until Muradov opens up his story for a large, wordless panel, kinetic and wild, releasing the pressure of the previous pages. Muradov’s story opens like Kafka—“F. Premise awoke one morning from troubled dreams to find that her innocence had gone missing.”—but it’s a bit more lighthearted of a story. Where Kafka’s Gregor falls into despair, Muradov’s F.—though beset by suspicious passersby and berated by her father—remains plucky. Tracking her lost innocence to a nearby Fed Hex office, F. discovers a hidden world and makes a momentous decision about her life. You’ll like F. and the shopkeeper who befriends her; you’ll enjoy Muradov’s curious, wordplay-filled dialogue; you’ll fall head over heels for his inventive, ambitious artwork. We’re very pleased to have Roman Muradov illustrating the March issue of the Slate Book Review. (In a Sense) Lost & Found by Roman Muradov. Nobrow Press.